Unlike traditional pastry, a quinoa crust is super-healthy – it provides a good dose of protein, fibre, manganese and phosphorous. Roasted pumpkin is naturally sweet, perfect in this tangy blue-cheese filling. 1. Place the quinoa and stock in a small saucepan and bring to the boil. Reduce the heat to low, cover and simmer for 12 minutes or until the stock has been absorbed. Set aside to cool. 2. Meanwhile, pre-heat the oven to 180°C (350°F) and line a large tray with baking paper. Combine the pumpkin with the chopped sage, honey and 2 teaspoons of the oil and spread over the tray. Season with sea salt and freshly ground pepper and roast for 25-30 minutes until tender. 3. Mix together the quinoa, parmesan, egg and white and season well. 4. Lightly spray four 12cm (4½ inch) round non-stick fluted tart tins with oil (see tips). Press the quinoa mixture firmly into the tins to form a thick crust. Place on a large baking tray and bake for 15 minutes or until light golden. 5. Mix together the ricotta and blue cheese and spread a little into each tart crust. Top with the roasted pumpkin and bake for 3-4 minutes to warm through. 6. Meanwhile, heat the remaining oil in a small saucepan over medium-high heat. Add the sage leaves and stir for 1-2 minutes until crisp. Drain on paper towel. 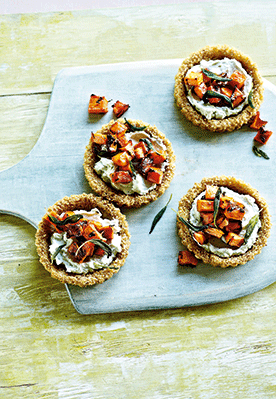 Serve the tarts topped with crisp sage leaves. This recipe is vegetarian if you use parmesan and blue cheeses made with non-animal rennet. You will need about 750g (1lb 10oz) pumpkin with the rind on to yield 500g (1lb 2 oz) flesh. Be sure to use well-greased non-stick tart tins or the crusts will stick.